The Scandi Round Dining Table combines simplicity and style in classic Danish form. Its 42" diameter makes the Scandi a perfect choice for eat-in kitchens, apartments and other compact spaces. 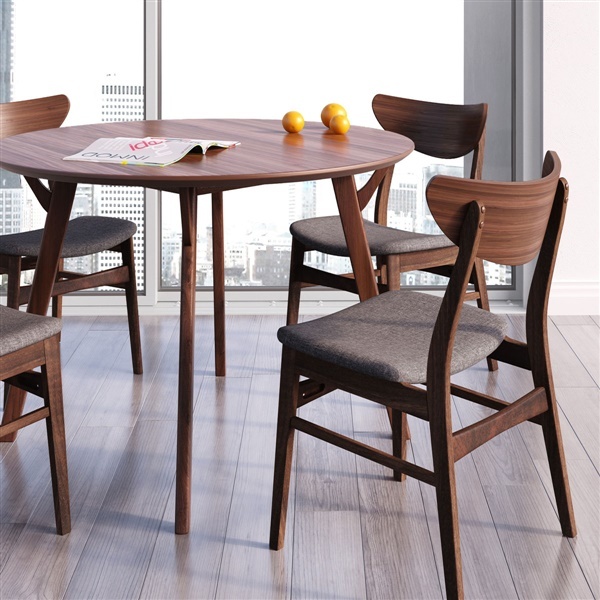 Its beveled top is crafted from American walnut veneer, which sits atop an elegantly Scandinavian inspired base consisting of four solid wood legs and supportive arms. Casual and compact, this was the best choice for my kitchen - I wanted to separate where we had breakfast in the morning and where we had dinner at night, so happy it arrived! GREAT QUALITY, PERFECT SIZE AND MATCHES PERFECTLY! A big SHOUTOUT and THANK YOU to customer service who told me which chairs are shown with this table, dolphin dining chairs match exceptionally well and the pic is actually what prompted me to go for this purchase, they look great together in person, thanks again! hit all the right marks! I love the way it looks in my kitchen!! Just discovered this site, it's amazing! I love my new table and I love INMOD, thanks! First time buyer and I wanted to give a big THANK YOU to Inmod for selling unique and high quality furniture with TREMENDOUS customer service who are not only informative when it comes their furniture but excellent at giving good recommendations! Thank you! Walnut top is gorgeous!! Beautiful pattern and that added element towards the top of the legs where they meet the top of the table is sharp looking - perfect and subtle! Really happy with the quality of the table and also the rounded and beveled edges, finally i feel a little more at ease when my kids are running around the house! I am very pleased with the Scandi table and chairs set! They look beautiful. Great quality. Tricky putting it together - had to have help. We are fairly pleased with this table. We were looking for one like this for a long time (round, about 40", walnut, this style of legs), and were happy to find this on sale. It was out of stock so it did take several weeks to finally get to us, though we were aware of this when we purchased it and didn't mind. It was easy to assemble. The legs look great but I do think the table top has a little too much grain, makes it looks a bit cheaper. After assembly, we noticed the table edge already had a small chip, so how this holds up remains to be seen. Feels sturdy. ConsStyrofoam packaging �€” it's so terrible for the environment, and such a mess to clean up. Table edge chips rather easily. High-quality, sturdy, attractive - paired nicely with the scandi dining chairs and arrived in perfect condition. Entire family love the new addition. I was pleasantly surprised to come across such a nice table at such a good price. I ordered it as soon as I saw it. When it arrives there was no damage and it was easy to assemble (I did it myself). I received the table in solid packaging with no shipping issues. It was a manageable size and the directions were easy to follow to put the legs on with one person. The finish was close to the photo online and no off-putting blemishes anywhere on the surface. I was very pleased with the style and color, and it fits great with the chairs I purchased from a separate company. The only con is that I accidentally hit something hard against the edge and it chipped the table pretty easily. While it was my fault, I was bummed that it didn't withstand the bump a little better. But, I like the table, so it just has a bit more character to it! Hi! What material is the table top made from? The description just says walnut veneer. Is it wood, or MDF, or something else? Also, is this wood more warm-toned or cool-toned? It's difficult to tell from the photos. Thank you! The table top is made of MDF with a wood veneer. The legs are made of solid wood. The wood is going to be an American Walnut finish, which is a warm medium wood tone. hi - what chairs would match with this table?